Anthony’s love of his fellow creatures inspired three more animal books – all of them about real creatures. 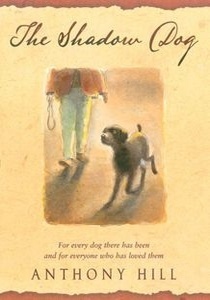 The Shadow Dog is the story of Anthony’s own dog, Sebastian: who was dumped as a puppy ... was rescued ... and brought home to grow up with Gillian and Jane and their other pets in the family home. There’s Sandy the old golden retriever who taught Sebastian his manners, and the ginger cat Toby who taught the pup his place in the world … There is joy and companionship … and there are also tears as time takes its toll and one by one the pets are taken on their last walk together. But that is what having an animal means. Beautifully illustrated with sepia ink and wash drawings by Andrew Mclean, The Shadow Dog is dedicated to every dog there has been – and to everyone who has ever loved them. 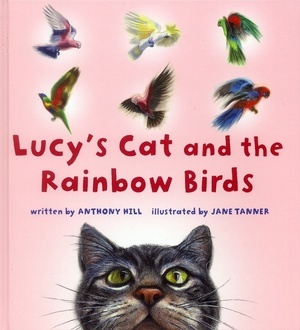 The family cat reappeared in Anthony’s first picture book for younger children with the artist Jane Tanner, Lucy's Cat and the Rainbow Birds. Toby was always trying to catch the parrots in Anthony’s garden, so they put a bell around his neck. The cat learnt to walk without the bell ringing, so they got a second bell … and yet a third, fourth and fifth bell. Only then could the cat not walk without at least one of the bells rattling to give the birds Fair Warning. Now called Artemis (or ‘Artie’ for short), and given a tabby coat, the cat glides, slides, creeps and leaps through Jane Tanner’s magically vibrant, colourful and witty pastel illustrations. Even the simplest family anecdote can be the start of a highly recommended picture book. Altogether more solid was the research involved for the story of Harriet, an ancient Galapagos tortoise who lived at the Australia Zoo in Queensland. 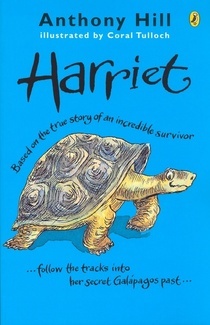 It was said that Harriet was one of the tortoises collected by the evolutionary scientist Charles Darwin when he visited the Galapagos Islands in HMS Beagle in 1835. Was it true? Anthony spent nearly five years reading old newspapers and documents at the National Library of Australia, trawling the internet, studying histories and antique maps trying to discover Harriet true story. He got her back to 1860 … and while he thinks the Beagle connection is more likely than not to be correct, he couldn’t find the last little bit of evidence to clinch the argument. But it’s an important example of the nature of historical research. And Anthony’s always loved history. It was his favourite subject at school. As a former journalist he is happiest writing about real people, real places and real events … trying to bring the past alive for present readers.